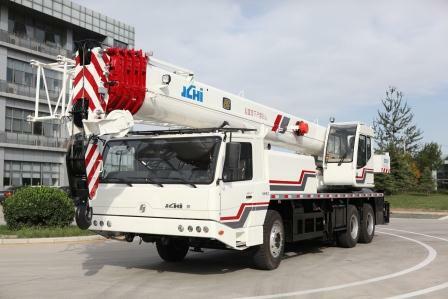 QY25H truck crane is developed and manufactured independently by Beijing Jingcheng Heavy Industry Co.,Ltd. It features nice appearance, convenient operations, great reliability, electric-hydraulic proportional control and convenient operation, and can meet the requirements of different end users. Equipped with five-section telescopic boom of U-shape structure and one-cylinder double-rope telescoping mechanism, its lifting performance is superior to other similar products. hydraulically controlled check valve. Electronic crane level indicators. Hydraulic pump Quadruple gear pump driven by engine through P.T.O.